Good news on the injury front for a few players. David Wright is heading back into the Mets' lineup tonight against the Phillies. With Lucas Duda hitting the 15-day DL this past week, Wright should slide right in. Duda has been having back issues for most of the season, and will not be back until early September. Duda was hitting the ball fairly well before he went down, but has been replaceable most of the season. George Springer is scheduled to take batting practice today, and possibly head out for a rehab assignment late in the week. 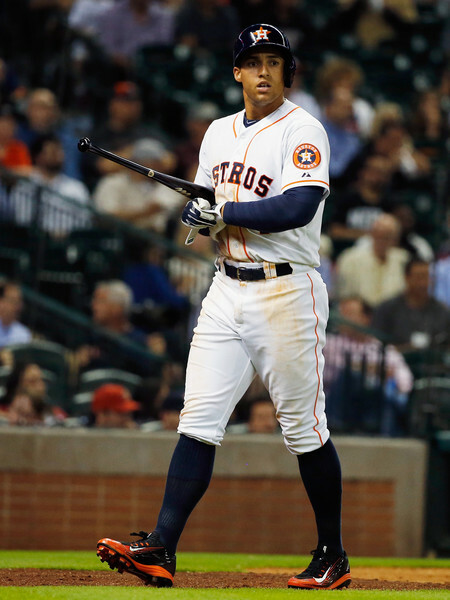 Springer could return to the Astros in the beginning of September. He has been on the shelf for the second half, but the Astros have continued to win without. Onto some not so good news for big time players, Dustin Pedroia will be out until middle of September now, and really can't expect much of him anyway for the rest of the season. You probably knew that anyway, his teammate, Clay Buchholz is in a similar situation. He was cleared for throwing, but by the time any rehab is complete, a start or two from him won't have any value. Corey Dickerson is doing strength exercises, but still no timetable for a return for him. Giancarlo Stanton has continued to have pain when trying to take batting practice, and had to skip a day during the week because of it. This is not encouraging news, and with the Marlins being so far out of it, no need to rush him back and risk further damage. He has been in uniform lately, but that doesn't really say anything. Christian Yelich and Jose Fernandez both remain without a timetable too, so the Marlins core fantasy players are all big question marks for the rest of the year. Some newer injuries from the last article, and DL stints to look at Jorge Soler, J.J. Hardy, Randall Grichuk, Hunter Pence, C.C. Sabathia, Aaron Hicks, and Billy Hamilton all landed on the DL. Soler and Hardy have been the more recent ones, and Soler is dealing with an oblique injury. He will be reevaluated later in the week, expect to see more of Chris Coghlan in the outfield. Hardy left the game on Sunday with a groin strain, and Hicks is dealing with a similar issue. Both could be out for some time, we have see the strains take longer than the 15 days to recover from. Not that Sabathia has had much fantasy success, but he will have his knee drained again. Pence has an oblique strain as well, but good news is the Giants will get Angel Pagan back soon. Grichuk has a ligament sprain in his elbow, and expects to miss about two weeks more. Mid-September is likely when you will see him again. There are some guys do back, or heading on rehab assignments this week. Denard Span has been dealing with back issues, but is expected to rejoin the team in the next few days. Alex Gordon is heading out on rehab this week, the Royals should be getting him back at the end of the week, as long as there are no setbacks. David Freese has similar news, Angels will get him back in their lineup at the end of the week.